The anti-Semitism of the Nation of Islam leader has no place in America’s civil society. In January, photojournalist Askia Muhammad released a long-suppressed photo of Senator Barack Obama and the Nation of Islam’s Louis Farrakhan. Muhammad admitted that he had acquiesced to a demand from a Congressional Black Caucus official to bury the photo amid fears that word of an association between Farrakhan and Obama could scuttle any future presidential aspirations of the senator from Chicago, the home of Farrakhan and his Nation of Islam. For twelve years, that photo, taken at a CBC meeting on Capitol Hill in July 2005, remained hidden. However, Askia Muhammad was not the only person taking pictures that day. Kenneth Muhammad, a photographer for the Final Call, a Nation of Islam publication for which Askia Muhammad also worked, took a group photo of Farrakhan surrounded by 20 or so members of the CBC, many of whom still serve in Congress. But unlike the Obama-Farrakhan photo, the group photo has been hiding in plain sight, accompanying an article about the CBC gathering — an article on the Final Call’s website, and written by none other than Askia Muhammad. Though not all 43 members posed for the photo (Senator Obama is missing,) a number of prominent and influential members of the CBC are pictured gathered around Farrakhan and smiling, among them G. K. Butterfield, John Conyers, Maxine Waters, Sheila Jackson Lee, and Barbara Lee. Some in the photo cannot be identified because of the small size of the photo or because their faces are partially obscured. About 20 of the CBC members in 2005 still serve in Congress today. Although Muhammad wrote that CBC chairman Watt spoke to “reporters” after the meeting, no media outlet besides the Final Call reported the event. Whether the reason for the lack of media interest — that the meeting was “unpublicized,” or simply that President Bush had nominated John Roberts to be the chief justice of the Supreme Court the day before and attention was focused there — the twelve-year blackout on a meeting between virtually every member of a prominent Democratic caucus and a virulent anti-Semite such as Farrakhan is remarkable. The broader media’s silence on the CBC meeting with Farrakhan in 2005 is remarkable but far from unique. In 2002, the Final Call reported that Farrakhan briefed the CBC at the Capitol at the invitation of John Conyers, a Democratic congressman from Michigan at the time. The subject was Farrakhan’s trip to the Middle East to “stop a war against Iraq and quell the violence among Palestinians and Israelis.” Democrats in attendance included Representatives Maxine Waters (D., Calif.), Gregory Meeks (D., N.Y.), Sheila Jackson Lee (D., Texas), and Mel Watt. The article includes a photo of Conyers and Farrakhan together at the briefing. The next month, Farrakhan spoke at the 32nd annual legislative conference of the CBC, where as the “special guest” of Conyers and Earl Hilliard (D., Ala.), he “held capacity audiences spellbound,” again according to the Final Call. Farrakhan also “attended the CBC banquet at the conclusion of the convention and was mobbed by celebrities, supporters and members of Congress.” Jet magazine, which reported on the conference and included a photo of Farrakhan and Kweisi Mfume (who was then the president of the NAACP) at the gathering, was the only outlet to note Farrakhan’s presence. 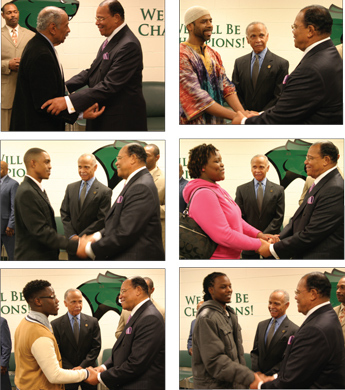 Four years after the 2002 conference and about six months after the CBC meeting in 2005, several CBC members met with Farrakhan in New Orleans in 2006, as I noted in the Wall Street Journal in January. Farrakhan said to the group, “Tell me how I can be of service.” Maxine Waters responded, “I think we need to get together and talk about how we’re going to put New Orleans [an apparent reference to Hurricane Katrina recovery efforts] on the national agenda.” Whether or not such a strategy meeting took place is unclear. A mere five months later, however, Farrakhan was invited to an event in Detroit to honor Conyers for his 50 years in Congress. Video of the celebration shows Senator Carl Levin (D., Mich.) and Representative Sandy Levin (D., Mich.) sharing the stage with Farrakhan. During his remarks, Farrakhan alluded to his being “rebuked” by Conyers for the earlier, 2013 speech. According to the Final Call, however, Farrakhan also “thanked the congressman for inviting him to be at his table at the Congressional Black Caucus annual weekend at a time when the Minister faced widespread criticism,” apparently a reference to the CBC conference in 2002. Farrakhan posed for photos with Conyers at the Detroit event. The next year, Conyers attended two events with Farrakhan. 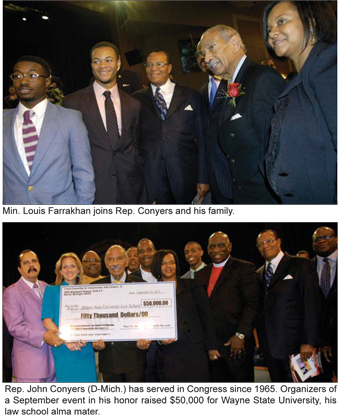 In February 2014, Conyers was publicly recognized by Farrakhan at the latter’s annual Savior’s Day address. Then in April, both Farrakhan and Conyers addressed a conference on slave reparations in Chicago, sitting next to each another on the stage. In a report on the conference, once again in the Final Call, Conyers and Farrakhan are pictured greeting each other warmly. Despite these numerous, publicly accessible articles and videos, the associations between the Congressional Black Caucus and Louis Farrakhan have been largely ignored over the years by the media, even the conservative press. From the warm greetings and fond remembrances from both Farrakhan and CBC members captured in these stories and videos, it seems likely that many more private get-togethers took place over the years. Though some CBC members have publicly condemned Farrakhan after my Wall Street Journal op-eds, others have remained mum or even renewed their support. Only one CBC member’s office has responded to my requests for comment, and that was simply to report that the congressman would have no response. Given the weight of the evidence of an ongoing relationship between the CBC and Farrakhan, it is difficult to see how it can continue to equivocate on the issue. The unwillingness of the Congressional Black Caucus to firmly and permanently separate itself and its members from any connection with a man well known for his black separatism and anti-Semitic rhetoric can continue only with the complicity of a willing and silent media. Jeryl Bier is a freelance writer.